Please let me know via our contact form if you have any news or events you’d like us to consider sharing! Facebook Group. 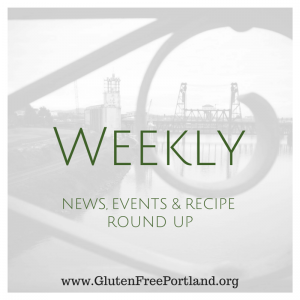 Did you know that we have a Gluten Free Portland facebook group with over 1700 members? 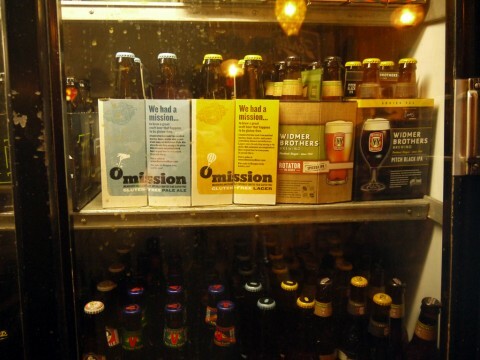 It’s an incredibly supportive place to get your questions answered about eating GF in PDX. I review member requests weekly. For Many Gluten isn’t the Villian. In Time. There are some parts of this piece that make me really frustrated but worth a read. The Myth of Big Bad Gluten. In the NYT. An opinion piece. Food for thought. Spouses and Relatives of Celiac Patients at Greater Risk of Autoimmune Disease. Brooklyn House Fire. Please jump over and donate to the gofundme for the Brooklyn House. They had a fire and are trying to rebuild. Let’s rally for our community here! Rosemary Chard Frittata. From My Blog. Nicoise-ish Salad. From Rubies and Radishes. Spicy Cashew Beef with Sweet Potato Noodles. From Everyday Paleo. PDX GIG Meeting Saturday July 11, 2015. Ongoing Gluten-free Support group. Gluten-free Food and Allergy Fest September 26-27 by Gluten-free & More Magazine. I’ll be presenting here as well, along with a number of other local folks: Laura B Russell, Kyra Bussanich, Nadine the Gluten-free RN and more…we’ll keep you posted as more info comes in. We just got the following notice. 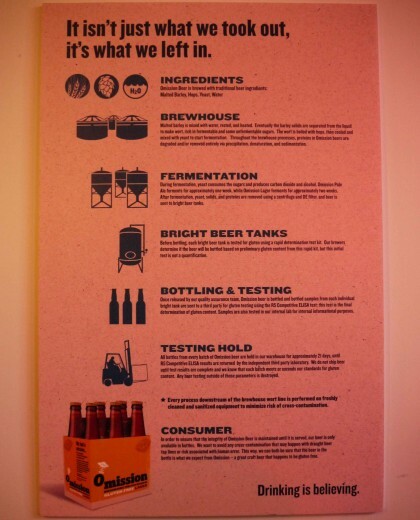 I’m not a beer drinker so I can’t weigh in personally but I know that we’ve got lots of beer lovers in our GF community! I’ll be there to check it out anyway, I mean a dedicated GF brewerly? Gotta. Harvester Brewing is pleased to announce the latest release out of their dedicated gluten-free brewery in the Experiment Ale series, a Dubbel style ale made with Belgian candi syrup. Similar to Harvester’s other beers, the Dubbel is made using roasted chestnuts but is differentiated by the addition of dark Belgian candi syrup. It’s lightly hopped with Styrian Goldings, and fermented with a blend of two gluten-free Belgian yeast strains. 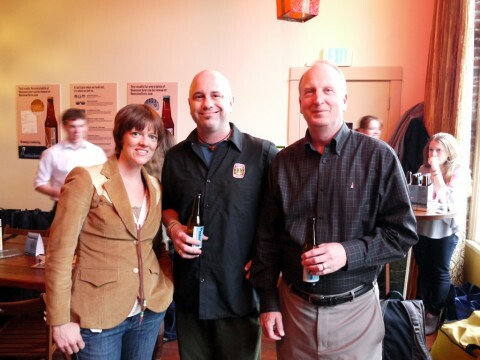 When Harvester founder James Neumeister was starting out as a homebrewer, he contacted homebrewing legend Denny Conn and asked him where he could learn to brew using the batch-sparge method that Denny advocates when homebrewing. Denny invited James over that weekend and after a day of brewing under Denny’s tutelage, his word quickly became the rule when James was homebrewing, prompting his other brewing partners to start referring to Mr. Conn as ‘Saint’ Denny. 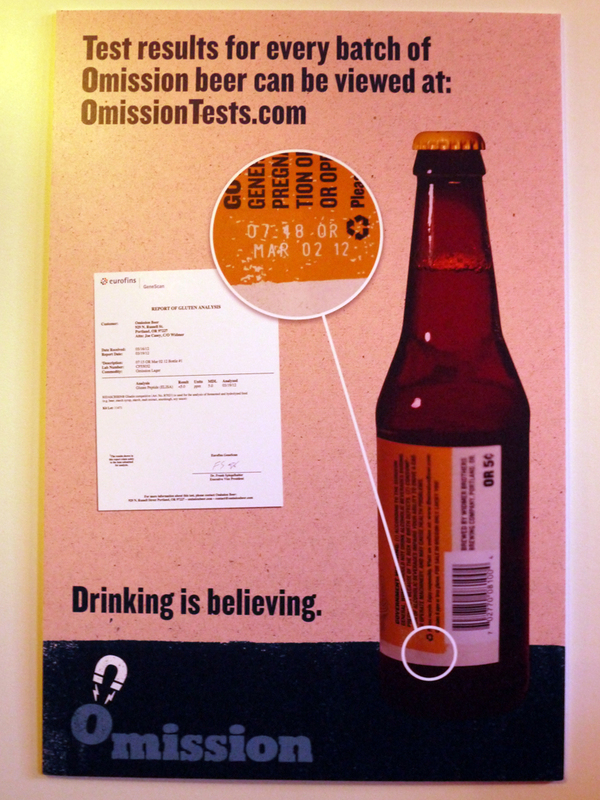 This background, combined with the common practice of Belgian style beers having ‘Saint’ names, led to the name St. Denny for this beer. St. Denny Dubbel style ale will be released at Harvester Brewing this Friday, April 12th at an event from 3:30 to 7pm. A very limited amount of the St. Denny Dubbel will be available on draft, only at the brewery. Bottles will roll out to store shelves next week and are available to order through Harvester’s online store now for shipment starting April 15th. 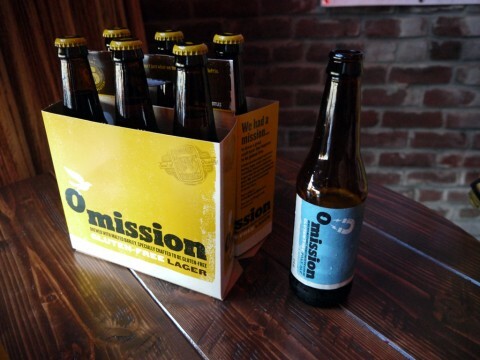 Omission Beer – New Gluten-Free Beer Coming to Oregon? We received a mysterious invite to an event this Thursday, where we’re kind of expecting a new gluten-free beer to be unveiled. The folks who invited us aren’t saying anything about it being gluten-free, only that they expect us to be interested. A visit to the Omission website reveals only a few hints of what it’s about, along with a place to sign up for updates (once you’ve verified that you’re age-appropriate). Look here for more information after the date. We’ve been really excited over the past couple of months about how many places here in Portland Oregon now offer gluten-free pizza! It’s really amazing, and would appear to mostly be thanks to one company, Nugrain Foods. Virgo and Pisces is one of the few places that make their own gluten-free pizza crust. Unfortunately, that’s about all I can say about their pizza right now because I didn’t try it during our visit to Virgo and Pisces. Virgo and Pisces is located on NW 21st Street at Glisan, so it’s located in quite a hot-spot. They’re just a half a block away from the New Cascadia Traditional Bakery and Trader Joe’s. We went there at 7:00 PM on a Friday night. Being in such at hot-spot at 7:00 PM on a Friday night, we were worried that we would have to wait before we could sit down. On the plus side, that was not the case. On the minus side, the place was practically empty, which I never take as a good omen. The space is nice. Our waitress was extremely helpful and the food came out promptly. Our one big complaint with the atmosphere was the music. The music playing in the bar was different from the music in the restaurant. That wouldn’t normally be a problem except that the music in the bar was turned up a lot louder, so we were treated to both at the same time. I find listening to two different pieces of music simultaneously to be jarring and annoyingly distracting. Sienna got a hamburger (which was not gluten-free) and I ordered the fish and chips. I’ve been on quite the fish and chips jag (what with our recent review of the Starfish Gluten Free Battered Cod, the gluten free fish and chips at Hugo’s Restaurant in Los Angeles, and the gluten free fish and chips at the Hawthorne Fish House, we’ve been looking really seriously at battered and breaded fish. So I figured it would be worth doing. 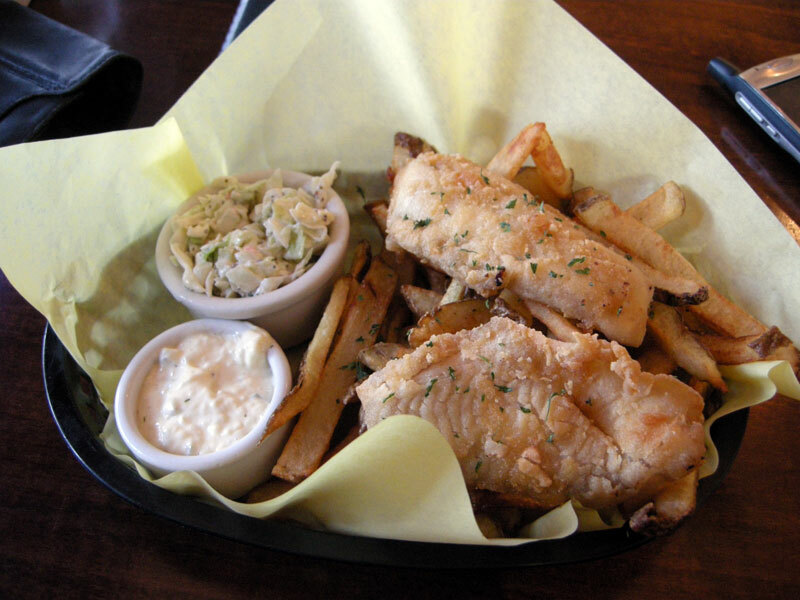 (By the way, Gina over at Gluten Free Gourmand has an excellent review of the Starfish Battered Halibut and Haddock.) At one point we had the idea that Virgo and Pisces had gluten-free pasta, but that is not the case. 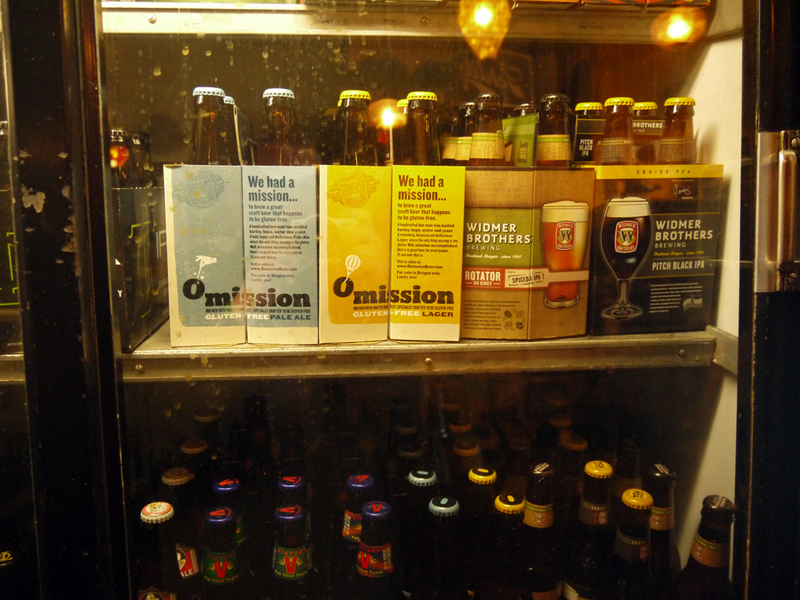 Virgo and Pisces also has gluten free beer. We’ll have to go back for their pizza sometime too. So how was the food? The food was good. It was pretty standard bar food kind of fare. If I had to come up with a word to describe the food it would be “functional.” The thing with bar food is very often you’re really there for something else, like some live music, or to knock back some drinks with your friends. Very often bar food is just background filler, even at bars that are known for their food. The food at Virgo and Pisces is like that. The fish was tilapia. I usually love tilapia, but in this case it was a little tasteless. The fries were a hair too mushy. The coleslaw didn’t turn me on, but I’m not really a coleslaw fan. Sienna’s burger was good. And that, dear reader, is about all I have to say about this place. I am curious about their pizza, but considering the place was empty on a Friday night, I don’t have big dreams about it. Maybe the place fills up once the music starts? 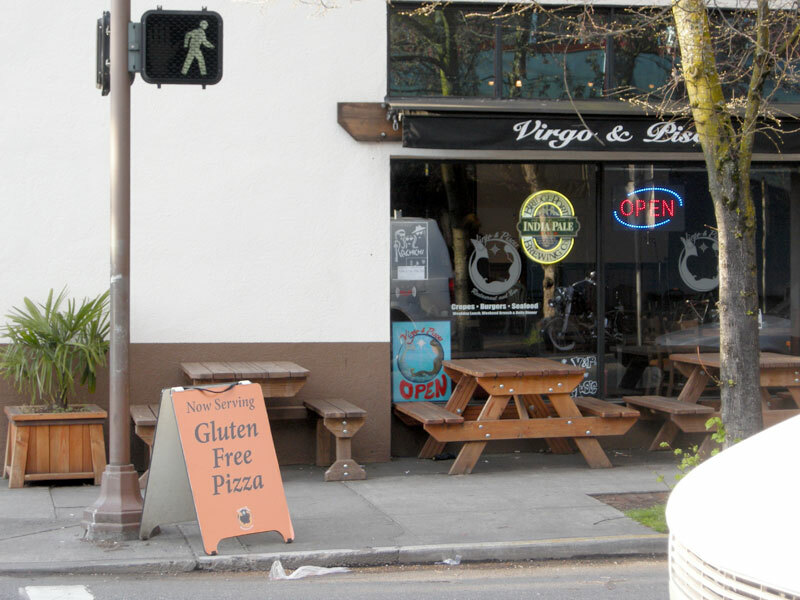 We want to know: Have you had the pizza at Virgo and Pisces? Let us know in the comments!